The YouTube app within iOS is somewhat dated, sluggish, and seems rather out of place in comparison to most of the other stock apps – most of which run smoothly and without too much fuss. YouTube’s HTML5-based web interface is much more inkeeping with the times, and has just been given a makeover rendering it a must-have for those who spend an unhealthy amount of time trawling through viral videos. With improved functionality combined with a fresh new look, you will find yourself seldom using the original YouTube app – if at all. You can test the new web version by yourself by entering http://m.youtube.com/new_visual_design in the address bar of Safari on your iPhone or iPod touch or simply head over to this link. I highly recommend you create a SpringBoard bookmark, which, even if you’re not a massive YouTuber, leaves an up-to-date logo of the Google-owned video sharing site for an icon as opposed to the unsightly old-school television set found on the stock app. 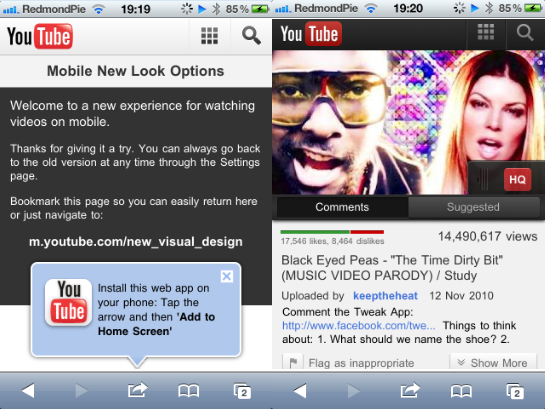 The YouTube web app, which was first released in July of last year, was the first opportunity for many iPhone and iPod touch users to try an alternative to the native app. This latest update pitches videos against darker looking toolbars and buttons which certainly makes navigating YouTube a little easier on the eye. It’s rather strange that Apple still ships its flagging YouTube app along with every single touchscreen iDevice, despite the blatant superiority of the web app, which eclipses the Cupertino’s effort in every department. One suspects a bookmark of the web app would be looked much more favorably upon than another dose of Apple’s in-house efforts come iOS 5. Apple has, to the annoyance of some and eternal gratitude of others; rejected flash in pretty much every way, shape, and form. Steve Jobs described it as having “major technical drawbacks,” and as such, much of the internet’s rich content is incompatible with the iDevice range – for now. Times are changing, though, and eventually – once HTML5 is adopted predominantly throughout the web – those using an iPhone, iPad or iPod touch will not have issues which arise when trying to use sites which staple diet consists of Flash.